Above: Supporters observe a moment of silence in remembrance of missing and murdered First Nations women and girls. VIU’s Nanaimo campus hosted a candlelight vigil for missing and murdered First Nations women and girls in on October 1. Approximately 50 people attending the midday ceremony. A sign on the grass at the event said that, according to RCMP, the number of missing and murdered First Nations women in Canada is over 1500. The sign is in the form of a letter to the Prime Minister asking for an inquiry. Guests were encouraged to sign it before they left. Brea Hodgkin-Bourgeois wore a sign during the vigil with information about her missing cousin. So did her son, Draydehn, one of her daycare children, Ayden, and her friend, Cindy Ross. 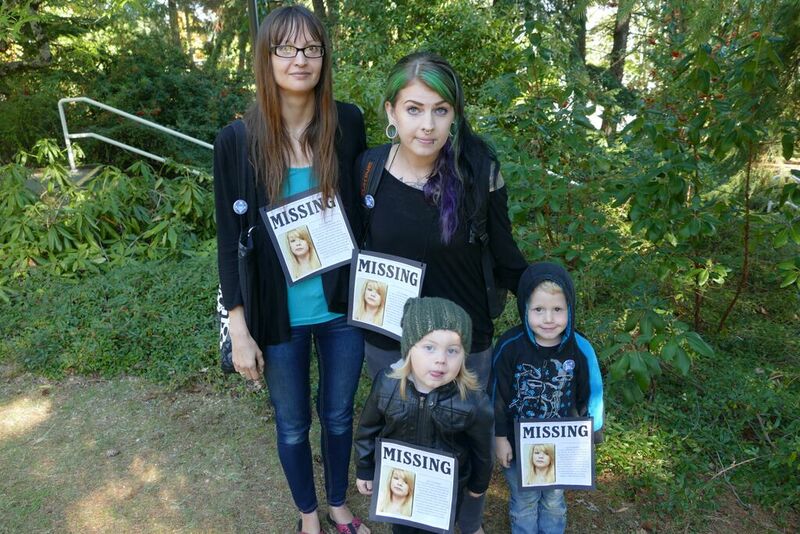 Hodgkin-Bourgeois said that her cousin Caitlyn Murray disappeared just over two years ago in Quesnel, BC. Hodgkin-Bourgeois attended another candlelight vigil the day before to recognize the anniversary of Murray’s disappearance. Each speaker at the vigil said that the ceremonies are designed to help the family and friends heal, as well as to facilitate change. Before singing a traditional First Nation “loon song,” Charlene Richardson explained that, in cases of missing women, the families never really get a chance to grieve, as they always hold onto a thin thread of hope. Richardson names Angelina Pete specifically, a woman from Vancouver Island who was last seen in North Vancouver seven years ago. Others shared their experience before the crowd or offered words of encouragement, and prayer songs were also sung. Then, the white candles were lit around the circle as people paid respect to the women being honoured in a moment of silence. The crowd was stoic, but tears were shed. According to the Sisters in Spirit website, BC has more missing and murdered First Nation females than anywhere else in Canada. McCarthy says that the Highway of Tears and Robert Pickton cases are both factors in the elevated numbers. There are several women missing in the central Vancouver Island area as well, such as Nanaimo’s 2002 case of Lisa Marie Young. RCMP are still trying to determine exactly what happened to Young, but foul play is suspected.